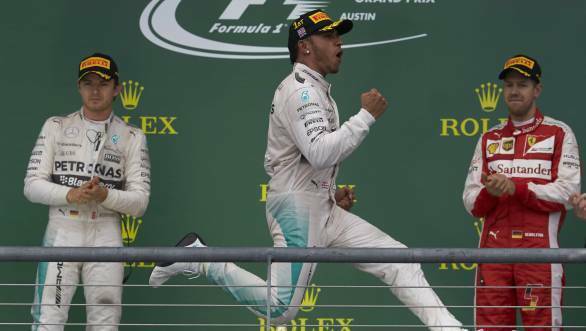 Lewis Hamilton claimed his third Formula 1 World Championship title at the United States Grand Prix at the Circuit of the Americas, Austin. And while it initially seemed like the championship would only be sealed in Mexico, it turned out otherwise the rather action-packed race that featured two virtual Safety Cars and sparring team-mates. There was drama right from the beginning. Hamilton was not only faster off the block, but also able to run wide, making contact with his team-mate and pole man Nico Rosberg. This meant that the two Red Bull drivers Daniil Kvyat and Daniel Ricciardo were soon up to second and third place on track. The first virtual Safety Car period was activated on the eighth lap of the race, to clear debris from various incidents that had taken place up and down the circuit. This threw things open once again. When the race was restarted, Hamilton managed to put some distance between him and the chasing Red Bulls who themselves were battling a hard-charging Nico Rosberg. The battle was on, and it was Ricciardo who got the better of his team-mate and Rosberg and managed to chase after Hamilton. Three laps later, Ricciardo would barrel right past Hamilton and set about increasing his lead over the rest of the field to ten seconds. Then Hamilton had to defend from team-mate Rosberg who simply wouldn't take no for an answer and managed to move his way up into second place. As the circuit dried up and the top drivers moved to slicks, the advantage began to slip away from Red Bull and move back in the favour of Mercedes. Rosberg tackled Ricciardo to take the lead, while Hamilton, who'd emerged from the pitstop behind all three, managed to slip past Kvyat. It would turn out to be a fight between the two Mercedes drivers. Then, the second Safety Car situation would arise, caused by the stranded Sauber of Marcus Ericsson on the 27th lap. While the top four would stay out, the other drivers, including Ferrari's Sebastian Vettel who still had a mathematical chance of taking the title away from Hamilton, would pit for fresh tyres. And while Vettel had started the race down in 13th place due to the grid penalty he had received, he carved his way through the field and with the help of fresh tyres, moved up to fifth. The second the Safety Car was called away, Vettel smoked past Kvyat and then Ricciardo too. When Ricciardo clashed with the Force India car of Nico Hulkenberg, there would be a second virtual Safety Car period, which meant Rosberg, Kvyat and Ricciardo once again dove into the pits. Hamilton and Vettel were still out on track. And with Rosberg coming out on track in fourth and quickly making it up to second, it was once again a Mercedes 1-2. This order only lasted until the Safety Car came out yet again when Kvyat ended up in the wall, and was soon reversed. The SC meant that Hamilton and Vettel could finally pit. And with Hamilton second, chasing Rosberg, the German made a mistake with just eight laps to go, running wide, allowing his team-mate back in front of him. Rosberg could do no better than second place, with Vettel taking third. And Max Verstappen storming through to fourth place. Hamilton claimed his third world championship title, one that he celebrated on the podium with smiles and tears in equal measure. But if you believe that the rest of the season is going to be boring, now that Hamilton is already champion, Mercedes boss Toto Wolff will tell you otherwise. Especially after Nico Rosberg has already accused his team-mate of driving into him on the first lap, dubbing it as an act that was taking things "one step too far". And the rivalry between the team-mates is such that Wolff is afraid that it could lead to another incident like Spa 2014.